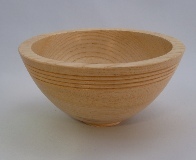 2 Day ‘WOODTURNING ADVENTURE’: A course for complete beginners. An introduction to the woodturning lathe and tools. Both days 9.30am - 4.30pm (½ hour lunch). Day 1: Learn safe and efficient use of various SPINDLE TURNING tools, using techniques to practice shaping and to create items such as garden dibber, light pull or honey dipper. Day 2: Introduction to BOWL turning tools and techniques. Create and polish a beautiful bowl to take home. Mon.9th Sept. & Tues. 10th Sept.